The Thrill of The Ride Tour 2014. Thomas the Tank Engine has been a part of my life since I can remember. In fact, the first time I watched it I was 4 years-old and it was one of the shows that helped me learn English. As I got older, I had fond memories of days where I wasn’t feeling well and my parents let me stay home with plenty of fluids, blankets and pillows and awesome TV. It was shows like Thomas the Tank Engine that helped brighten my days. Gabby grew up watching Thomas the Tank Engine and now Mimi does too. It is amazing that these lovable characters and story can transcend time and three generations! These days, we often watch Thomas the Tank Engine bright and early in the morning and sing along to the theme song REALLY LOUD! 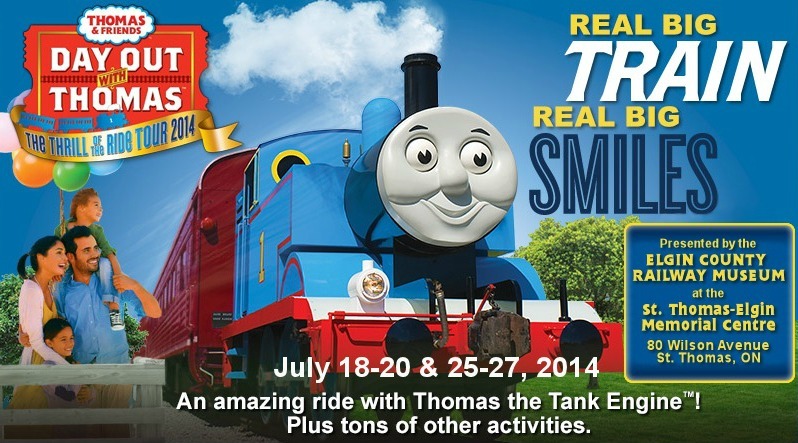 Next month, we are headed to St. Thomas to take in the Day Out with Thomas: The Thrill of the Ride Tour 2014! It is going to be super fun and we are thrilled to go see Thomas in the flesh, err, I mean steel! 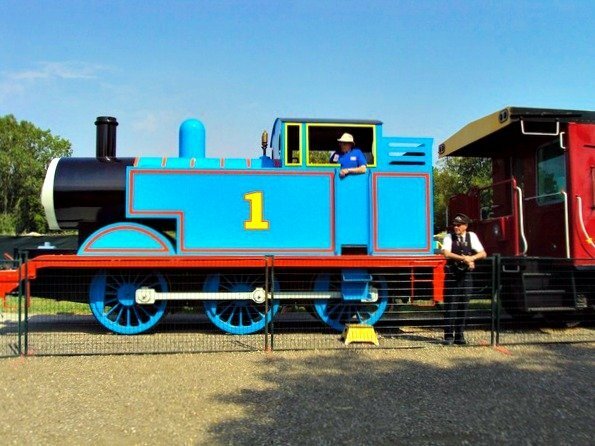 Day Out with Thomas: The Thrill of the Ride Tour 2014 is a fun-filled event where you and your little engineers get the chance to take a 25 minute ride on Thomas the Tank Engine, star of the popular Thomas & Friends series. Not to mention, you get to meet Sir Topham Hatt®, Controller of the Railway and enjoy a day of Thomas & Friends themed activities including arts & crafts, storytelling, live entertainment, inflatable bouncers, bubbles, a cool mist tent, temporary tattoos, hay bale maze, small animal petting form and so much more. 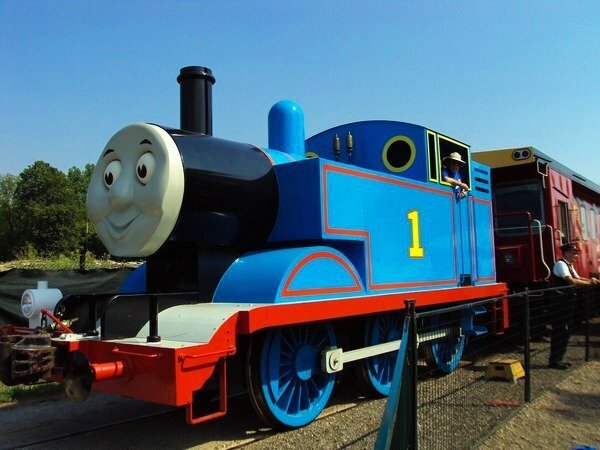 It is going to be so much fun and if your kids love Thomas the Tank Engine, besides taking a ride, Thomas will be talking to them for the FIRST time! It is on July 18 – 20, and 25-27, 2014, and will be hosted by the Elgin County Railway Museum at the St. Thomas – Elgin Memorial Centre. Set train ride times are specified on your ticket but include access to activities on the grounds for the entire day. Tickets on sale now! $25 plus tax for ages 2 and up. We are all super excited to spend the day together and with Thomas the Tank Engine. My husband says he is pretty geeked since, like me, he grew up watching too. Follow along on Twitter while I’m there but, I’m hoping to see you guys there too! Come back after the event and see how it went if you couldn’t make it. Do your kids watch Thomas the Tank Engine? This post was brought to you by Elgin County Railway Museum via SheBlogs. The opinions expressed herein are those of the author and are not indicative of the opinions or positions of Elgin County Railway Museum. My kids are older, but they still love Thomas the Train! They would love a day out with Thomas! My eldest is too but, she is still looking forward to it! This sounds awesome. My 4 year old little boy would love this. this looks like so much fun! I am sure my little nephew would just love this, I will have to take him. My boys always loved DOWT when they were younger!! It's definitely a fun day for little Thomas fans. Cannot wait to take them, hearing so many good things! My kids love Thomas but I have never taken them yo see him live *yet*. My kids were huge Thomas fans when they were younger. They would have loved to go on one of these trips! It will be super fun, hope he comes to your city! My son would be beside himself if he had the chance to go meet Thomas. I hope he's making a stop in our city. Have fun! I hope so too. That would be great! We hope to go to this when it hits NY. I have heard great things about it! My oldest never watched it much, but my twins do all the time. They would love to go to this! I think any kid would. Actually, even us. LOL. I have a nephew who loves Thomas the Train, that would be a highlight of the year for him!! Sounds like a fun day out! My daughters are looking forward to it. Big fans. Wow, a real like Thomas! How cool is that to see!!! We went to a Day Out With Thomas last year and we had the best time. Be sure to come back, I will let you know! That looks like it will be a ton of fun! It's funny how popular Thomas was when I was younger and he is still popular nowadays. Since we were kids and now we are taking our kids to this! COOOL. Oh man, we are huge Thomas fans at our house! In fact when my little girl was a baby the roll call song was her favorite to calm her down in her car seat! We love that song! You should go! What fun! My son definitely watched when he was younger. We did this a few year back with my 2 oldest children and it was so much fun. Definitely an event to make some neat memories at. That is awesome to hear, I cannot wait to make some. Thomas the tank engine is one of my son's all time favorites! He watches it constantly! Day Out With Thomas is a blast! Oh my gosh, kids would be squealing with excitement. Riding on Thomas? That is AWESOME! I wish this was closer to us. My son loves Thomas and would think this was so cool! My daughters love Thomas too! My family went to this a few years ago and it was so much fun for our whole family! We cannot wait. So excited!! My 1 year old daughter has recently started to show interest in trains on TV. I think she would really like this a lot! We've never gone to this event, but we've wanted to! They have had it in CT near us! This looks like so much fun! Your girls will have a blast! It will definitely be fun!